The added species show that much of the life that we see around us is just a tiny percentage of the world’s biodiversity. The tree of life has undergone a dramatic makeover due to the addition of over 1,000 new species discovered in recent years. The added species, mostly bacteria and single-celled microorganisms known as Archaea, show that much of the life that we see around us represents just a tiny percentage of the world's biodiversity. "The tree of life is one of the most important organizing principles in biology," Jill Banfield of the University of California at Berkeley said in a press release. "The new depiction will be of use not only to biologists who study microbial ecology, but also biochemists searching for novel genes and researchers studying evolution and earth history." The new tree of life and related findings are published in the latest issue of the journal Nature Microbiology. 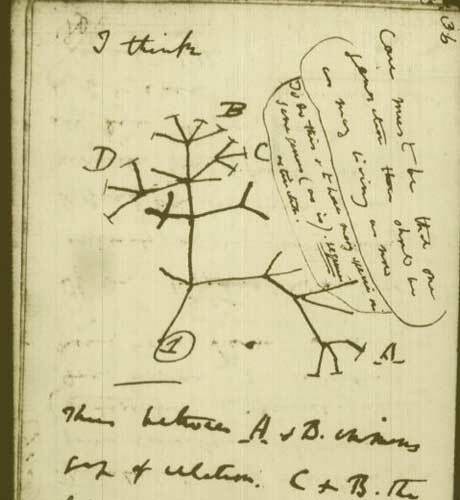 Charles Darwin first sketched a tree of life in 1837 as he sought ways of showing how plants, animals and bacteria are related to one another. The tips of the twigs on such images represent life on Earth today, while the branches connecting them to the trunk indicate evolutionary relationships. A branch that divides into two twigs near the tips of the tree shows that these organisms have a recent common ancestor, while a forking branch close to the trunk implies an evolutionary split in the distant past. But Darwin knew nothing of the newly added microorganisms, which before their discoveries over the past 15 years were lurking unseen in Earth's nooks and crannies. It was only after the genome revolution that technical advances permitted Banfield and others to search for other life forms directly in the field, as opposed to trying to culture them in a lab dish. It would be to find some of the new organisms in a lab dish anyway, since many microbes cannot be isolated and cultured. That is because they cannot live on their own. They must beg, borrow or steal from other animals or microbes, either as parasites, symbiotic organisms or scavengers. "Bacteria and Archaea from major lineages completely lacking isolated representatives comprise the majority of life's diversity," said Banfield, who also works at the Lawrence Berkeley National Laboratory. "This is the first three-domain genome-based tree to incorporate these uncultivable organisms, and it reveals the vast scope of as yet little-known lineages." The additions to the revised tree of life, only known from their genomes, come from a variety of environments. They include the human gut, dirt under toxic waste sites, a hot spring in Yellowstone National Park, toxic puddles in abandoned mines, a salt flat in Chile's Atacama desert, terrestrial and wetland sediments, a sparkling water geyser, meadow soil and the inside of a dolphin's mouth. A new star player on the tree of life is a group of bacteria described as the "candidate phyla radiation," which forms a very major branch. This group is now believed to contain around half of all bacterial evolutionary diversity. Co-author Brett Baker said, "This incredible diversity means that there are a mind-boggling number of organisms that we are just beginning to explore the inner workings of that could change our understanding of biology." An expanded view of the tree of life, with clusters of bacteria (left), uncultivable bacteria called ‘candidate phyla radiation’ (center, purple) and, at lower right, the Archaea and eukaryotes (green), including humans. Americans on average share their homes with 100, and up to 211, different types of tiny animals known as arthropods, according to a new study. The study, published in the journal PeerJ, is the first to evaluate the biodiversity of such little creatures in U.S. homes. Arthropods are animals that have protective external coverings, segmented bodies and jointed limbs. They include insects, spiders, mites, centipedes and more. "I was surprised by the number of specimens we collected from very typical homes, as well as how many rooms we found them in," lead author Matt Bertone told Discovery News. "For instance I didn't expect some groups to be in every home we sampled, and I would not have expected, for example, cobweb spiders to be found in 65 percent of rooms." Bertone, an entomologist at North Carolina State University, and his colleagues also found a lot of ants, such as this search party of little black ants that succeeded in finding a morsel of food on a couch. He explained, "A variety of ants (Formicidae) can commonly be found in homes. These social insects often form trails of workers looking for food and water." Bertone and his team visited 50 free-standing houses within 30 miles of Raleigh, N.C., between May and October of 2012. The scientists went room to room, collecting all of the arthropods that they could find. These included both living and dead specimens. The scientists identified no fewer than 579 different types of arthropods during the survey. While the location of a home is a factor, it is expected that houses across the United States will have most, if not all, of the arthropods included on this list. One such creature is the book louse. "Book lice (Liposcelididae) are tiny insects found in many habitats, often in animal nests and human homes," Bertone said. "They are related to true parasitic lice but instead of blood and skin, book lice feed on molds, dead insects, stored food products, and other bits of organic matter." Entire families of some arthropods in various life stages can exist in a given home. This image shows the larvae of carpet beetles. "Like tiny pipe cleaners, carpet beetle larvae (Dermestidae) are covered in many hairs," Bertone said. "These hairs are specially modified to interfere with predators, clogging up the mouths of would-be hunters. Carpet beetle larvae typically feed on wool and other hair, feathers, and dead insects." He added that the vast majority of arthropods found in homes are not pest species. They are either peaceful cohabitants, or accidental visitors. Many of the tiny animals detected by the researchers had clearly wandered in from outdoors or were brought in on something, such as cut flowers. Not all accidental visitors or arrivals survive for very long indoors. Some drop dead pretty quickly. Cellar spiders, which do well in homes, help to consume some of the newly arrived, and newly dead. "Cellar spiders (Pholcidae), sometimes called daddy-longlegs, are thin legged and reside in webs," Bertone said. "They are often found in basements and crawl spaces, but can be found elsewhere in homes. Although they feed on small arthropods that they capture in their webs, they are also known to invade the webs of other spiders to eat the residents." A surprising finding from the study was that only five of the 554 rooms surveyed by the researchers did not contain any arthropods. Bertone said that we tend to think of our homes as sterile environments, but that they actually provide good evidence for biodiversity. One creature living in your midst is probably the dark-winged fungus gnat. "Many come from the soil of overwatered houseplants or compost bins," Bertone said. "They can be an annoyance, but do not bite." ), are also common members of U.S. households. "They create irregular webs, which have trip wires to the ground," Bertone said. "When crawling insects come into contact with these tight strands, the connection is broken and the prey gets pulled into the web." Certain non-human, non-pet residents of homes go in and outside of the house from time to time. Ground beetles, for example, sometimes willingly wander into homes, looking for prey. They might then crawl back outside. "They will feed on many types of small arthropods, ripping them apart with powerful mandibles," Bertone said. Homes with gardens clearly facilitate this indoor/outdoor lifestyle. While the researchers did not conduct the survey in apartments, they suspect that fewer such arthropods associated with outdoor environments would be found, but "maybe more pests," Bertone guessed. Different types of silverfish, such as the gray silverfish and the four-lined silverfish, are common in U.S. homes. "Silverfish (Lepismatidae) are ancient insects that lack wings and have shiny scales all over their body," Bertone said. "They are well adapted to living in homes because they can survive on low nutrient materials such as crumbs, dead insects and even glues, paper and leather." Also called drain flies, moth flies (Psychodidae) are similar to small moths, but are in fact true flies, Bertone said. "Their larvae inhabit pipes and drains, where they feed on the muck and organic matter that builds up. For this reason, adults are often found in bathrooms. The adults are harmless and do not bite." Flies, in general, constituted one of the most commonly collected groups of arthropods in homes. Outside of arthropods, U.S. homes contain still more different types of non-pet animals. Bertone explained that these other small creatures often commonly require high humidity or moisture to survive. "These types of animals, including various worms, snails, and slugs, may be present in some basements, but would be absent from the main parts of homes," he added. The well-named ghost spider exemplifies many of the tiny animals that the researchers found. It lurks around homes, mostly unseen, and spends a fair amount of time searching for food. Ghost spiders, like other so-called hunting spiders, do not make webs. "These types of spiders can be common in homes, crawling along the floor or up the walls," Bertone said. Entomologist Michelle Trautwein of the California Academy of Sciences, said that the new study provides "only a first glimpse into the species that live in our homes, and more work needs to be done to flesh this picture out." In the future, she hopes that more will be learned about how the tiny animals benefit, harm or otherwise affect ecosystems and human health. She also hopes their traits will be explored, to see if they share evolutionary characteristics that have made them better suited to live with humans. Bertone believes that the study's biggest take home message is that while the findings may be a little frightening to some people, "Most of the arthropods we found are harmless to humans and are very small and inconspicuous. They go about their lives and rarely interfere with ours."